Although the weather has been iffy I am busy preparing my Summer wardrobe! No summer wardrobe is complete without some cute bathing suits! Below are some of the bathing suits I have purchased for Summer/ want to purchase! I bought this suit on a whim! I fell in love with the blue and white stripes as well as how well it fit. When I shop for bathing suits I always go for full coverage bottoms. I feel most comfortable in them but I feel like they are incredibly hard to find. These fit perfect! The little ties at the top are adjustable and I found this fit TTS. I am wearing an XS in both the top and bottom. Unfortunately I was not able to find this online in the same color but I did find it in coral and white which is also super cute! For those who want a little more front coverage I found the blue and white pattern in this style that you can see here. I found this suit on ASOS and ordered it after seeing it on another blogger. 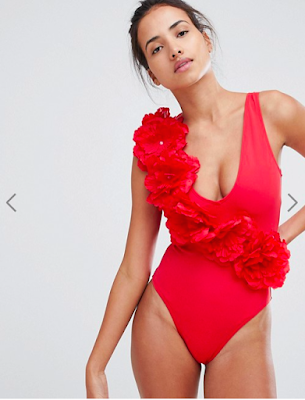 It is so different than anything I own and will really make a statement at Summer pool parties! I usually don't go for one pieces but this season there are so many cute ones! I LOVE this one piece suit. I have not purchased it yet but have seen it while shopping in Nordstrom. The neckline and lace really make this suit stand out! This comes in a lovely purple color as well if you like a more colorful bathing suit. One piece suits are definitely in this season and this is one that is sure to turn heads! This bikini is from the same line as the one piece above and another I have added to my wish list. What is really cool about this line is that there's a variety of styles to mix and match in both the tops and bottoms! I personally like this combo but would pair it with hipster bottom rather than the high waisted. This line has something for everyone including different styles of the one piece I posted above. Last but certainly not least is this adorable high waisted set. The little pom-poms and pops of pink are what has landed this set on my wish list. This color combo is so perfect for summer days at the beach and pool!